6. 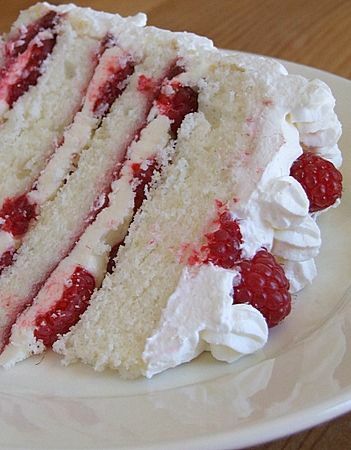 To Assemble Cake: Using a sharp serrated knife and a gentle sawing motion, slice each layer horizontally in half. Put one layer cut-side-up on a cake plate surrounded by strips of waxed paper. Spread it with a light layer of buttercream. Spread the buttercream with 1/3 of the preserves. Top with another layer, spread with buttercream and preserves and then do the same with the third layer (you'll have used all of the jam and have buttercream left over.) Place the last layer cut-side-down on top of the cake and use the remaining buttercream to frost the sides and the top. Decorate top with raspberries.